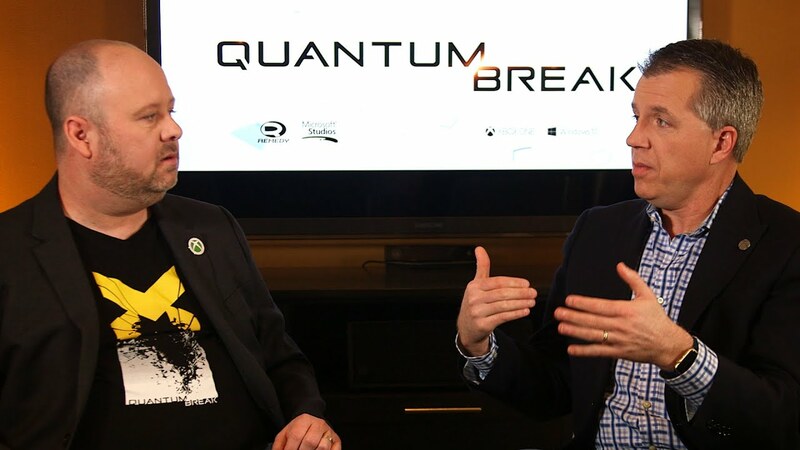 With less than two months away until the highly anticipated launch of Quantum Break, Remedy Entertainment and Microsoft Studios kicked things into high gear with a number of huge announcements about the upcoming cinematic action blockbuster. The most noteworthy? Quantum Break will also be launching on Windows 10 on April 5…and will be available at no additional cost for those who digitally pre-order the game on Xbox One*. Two of Remedy Entertainment’s most popular and critically-acclaimed classics – Alan Wake and Alan Wake’s American Nightmare – are now part of the Quantum Break experience. Every copy of Quantum Break for Xbox One will come with a full-game download for Alan Wake for Xbox 360, plus its two add-on packs, The Signal and The Writer, playable on Xbox One via Backward Compatibility. Fans who pre-order Quantum Break for Xbox One at participating retailers or through the Xbox Store will also receive a full-game download of Alan Wake’s American Nightmare for Xbox 360. For more details about the Windows 10 version of Quantum Break, including minimum and recommend hardware specs, please visit http://www.quantumbreak.com/windows10. To celebrate the upcoming launch of Quantum Break, Remedy Entertainment and Microsoft Studios also released a new, live-action trailer titled “The Cemetery.” Watch Quantum Break be brought to life as Jack Joyce (Shawn Ashmore) is hunted by agents from Monarch Solutions while he mourns the loss of his brother. But time isn’t the same anymore. It’s broken. And it’s the only weapon Jack has to survive a world in chaos. Xbox also announced a new Xbox One Special Edition Quantum Break Bundle featuring a 500GB Cirrus White console and matching wireless controller, a full-game download of Quantum Break and a full-game download of Alan Wake accompanied by The Signal and The Writer add-on packs. The bundle will be offered worldwide in most regions where Xbox One is available for $349 USD ERP starting March 29, 2016. For more information, check out the full Xbox Wire post here. * Free Quantum Break Windows 10 game offer valid with pre-order of digital copy of Quantum Break for Xbox One, by April 4, 2016, from Xbox Store, Xbox.com, participating retailers, or inside Xbox One Special Edition Quantum Break bundles, while supplies last (physical game discs are excluded from this offer). Quantum Break Xbox One codes purchased at retail and inside bundles must be redeemed on the console or at Xbox.com by April 4, 2016. Windows 10 game redemption code will be sent via Xbox system message around the week of April 5, 2016. For Windows 10 game system requirements see www.quantumbreak.com/windows10. Offer available in all Xbox Live markets except China. A blockbuster game with time-amplified action and a suspenseful storyline brought to life in a way never done before in the gaming world.